Prequels can be dangerous territory – there’s great skill required to make a story compelling when everyone knows how it will end. It remains to be seen whether the makers of Caprica, a prequel to the highly-successful Battlestar Galactica reboot, will succeed – but the pilot episode was promising enough. 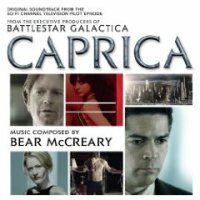 It’s the score to that pilot – by Galactica composer Bear McCreary – which is available on this CD from La-La Land Records. McCreary would also face quite a challenge here – his music for this universe is well-established and rather distinctive, but Caprica is a very different show, so he was faced with taking the music off in a very different direction. And that’s what he did – there are a couple of nods to his previous music, through occasional taiko drums and a theme from the previous series – but this is, by-and-large, a new sound for the composer. I love Bear’s work… but I’m not convinced that a full release of the pilot score was the way to go. There’s just too much music that broods quietly in the background. It would make for a *terrific* thirty-minute release, even forty minutes… but fifty-five is too much. I never get through the whole thing in one listening.